A luxury downtown condo project capped with million-dollar penthouses has won city approval. 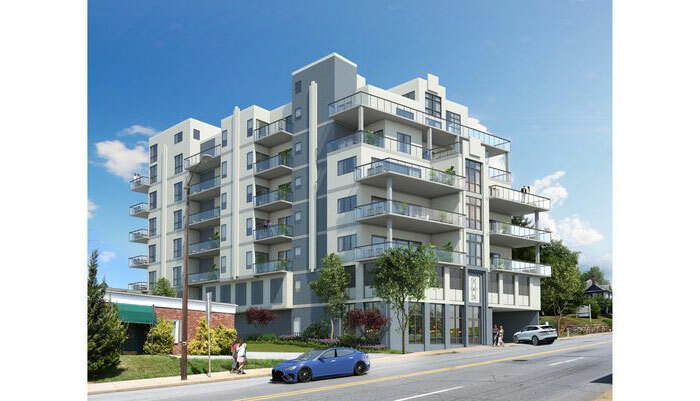 The planning and zoning commission voted unanimously Wednesday to approve the seven-story “145 Biltmore Avenue” project on the city’s South Slope. The building will back up to Lexington Avenue on a 0.3-acre lot now occupied by a small barber shop. Because the 77,803-square-foot building is small enough to fall in the city’s “Level II” category it only required approval by the appointed planning commission and didn’t need a review by the City Council. The project, which features “the largest balconies in Asheville,” one developer said, could see a construction start in May and be finished by early fall 2019, one develper said Thursday. Early plans for the building called for 27 condos. But by September 90 percent of the units had deposits by interested buyers. Developers have now reconfigured the parking to allow a total of 34 condos with one “live/work” unit. The one-, two-, and three-bedroom units will run from the “$500,000s” up to $1.4 million for one of the penthouses, said developer Al Sneeden, a partner of Preserve Communities Groups based in Marshall. The other three penthouses are under contract and Sneeden said he couldn’t disclose their prices. Large balconies will afford views, allow the rooms to feel bigger and increase usable space, the developer said. The building will have 43 parking spaces for residents and include a front sidewalk expanded to 10 feet. At Wednesday’s meeting two members of the public spoke about the project, raising concerns about size and affordability. Tim Robinson lives with his wife part-time in a Lexington Avenue Station condo west of the project and said they welcomed “high-quality” development. But Robinson said the tall building wouldn’t fit with the surrounding collection of one- and two-story structures. Matilda Bliss said the building would go on a spot now occupied by a long-time African-American-owned business. Bliss said if the business goes it would make sense to replace it with some affordable housing. The property is owned by Walter Wells and has a tax value of $500,100, according to Buncombe County property records. That’s up from $292,700 in 2016. The property includes a one-story masonry building. Wells has owned the property for many years and as of early Thursday afternoon there was no sale recorded in the county register of deeds office, an employee there said. Responding to concerns raised at the meeting, planning commission chairwoman Laura Hudson said the city’s downtown plan called for this type of development. “The idea is we want to grow the downtown to have larger denser projects so we have people who can walk downtown and not drive there cars,” she said. As for cheaper rents, Hudson said the commission’s role was limited.